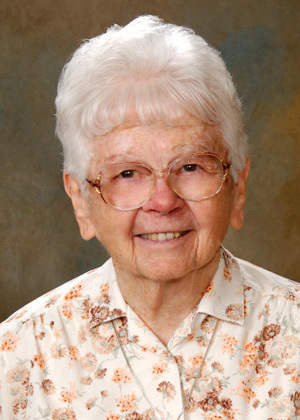 Sister Muriel (Baptist) McCarthy, BVM died Friday, Nov. 2, 2018, at Marian Hall in Dubuque, Iowa. Visitation will be from 9–10:15 a.m. on Tuesday, Nov. 6, 2018, in the Marian Hall Chapel. Sharing of Memories will be at 10:15 a.m., followed immediately by the Mass of Christian Burial. Burial is in the Mount Carmel Cemetery. She was born on Jan. 5, 1921, in San Francisco, to Michael Joseph and Mary Dolores Campbell McCarthy. She entered the BVM congregation on Sept. 8, 1939, from St. Anne Parish, San Francisco. She professed first vows on March 19, 1942, and final vows on Aug. 15, 1947. Sister ministered as an elementary teacher at St. Francis Xavier in Kansas City, Mo. ; Our Lady of Angels in Chicago; St. Bernard and Assumption in Los Angeles; Our Lady of Lourdes in Tujunga, Calif.; St. Anne in Santa Ana, Calif.; and St. Paul and St. Thomas More in San Francisco. She served as principal at Assumption in Los Angeles and Our Lady of Lourdes in San Francisco and secondary teacher at St. Vincent in Petaluma, Calif. She also was a parish minister, office assistant and teacher aide at St. Thomas More, in San Francisco and worked for Catholic Charities in Santa Rosa. She was preceded in death by her parents; a sister, Dolores Kelly; and a brother Francis. She is survived by nieces, nephews and the Sisters of Charity, BVM, with whom she shared life for 79 years. Sister Muriel taught me in 8th grade at St. Anne’s, Santa Ana, California in 1958-59. I kept in touch with her all these years and visited her whenever I was in California. She was a great encouragement to me as a “young sister” after I entered the Sisters of the Holy Cross in 1963. I was saddened in recent years when I was no longer able to communicate with her via mail. As Sister Mary Baptist, she was strict, disciplined, and focused as an educator. She was a model of quiet, sure strength and spirituality. Providentially, I inquired about her only yesterday through your archivist., only to learn of sister’s death today. She always challenged her students by saying, “I’m from Missouri. Show me!” It was years before I learned she was actually from San Francisco. She certainly “showed” me God’s smile and love. Now God shows her and shines back. us. Sometimes she didn’t have to say anything, it was just a look. clean up the school in the summer to help lower our tuition . My brother would wash her car , and later would give her and the other nuns rides when they needed them. All this really helped my parents out with tuition for the 5 of us. For that, I am also grateful. Thank you Sr Mary Baptist.